This Saturday, 19 August, we will have the opportunity to see the theatrical work Dolça Sodoma meva by Laurent Gaudé. 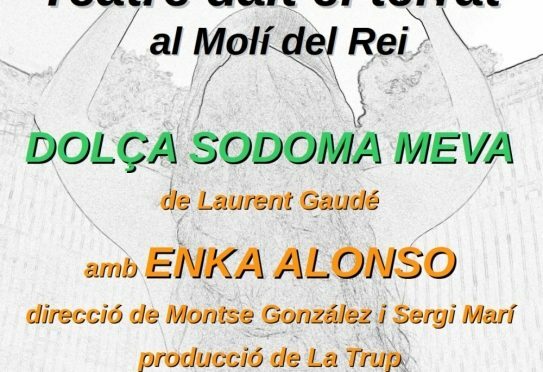 It will be in Catalan and is directed by Montse González and Sergi MarÍ and is produced by La Trup.It is the fourth small event taking place in the central office of the association, in Camí des Castell 53 of Mahon, continuing the celebrations of the 40th anniversary of GOB in Menorca. The event will start at 19.30. Entry is free and at the end there will be a tasting of products from the network of agronatural farms that have signed up to the Land Stewardship Scheme. It takes place with the help of the Consell Insular and of La Trup.